• Sensitive and accurate. Detection range 0.02 mM (0.19 mg/dL) to 2 mM (19.2 mg/dL) sulfate in 96-well plate assay. • Simple and high-throughput. The procedure involves addition of a single working reagent and incubation for 5 min. 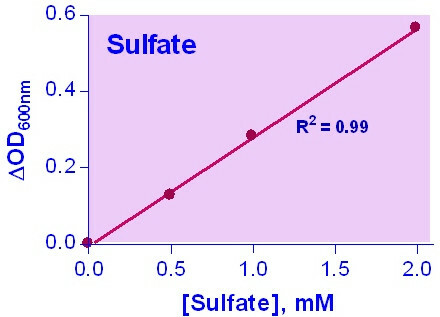 INORGANIC SULFATE is one of the most abundant anions in mammalian plasma. Sulfate plays important physiological roles in activating and detoxifying xenobiotics, steroids, neurotransmitters, and bile acids. Sulfate is needed for the biosynthesis of glycosaminoglycans, cerebroside sulfate, and heparin sulfate. Undersulfation of cartilage proteoglycans has been associated with human inherited osteochon-drodysplasia disorders. In mammals, sulfate homeostasis is regulated by the kidney. The majority of filtered sulfate is absorbed in the proximal tubules, and only 5–20% of the filtered load is excreted into the urine. Simple, direct and automation-ready procedures for quantitative determination of inorganic sulfate find wide applications in research and drug discovery. BioAssay Systems’ sulfate assay kit is designed to measure sulfate concentration in biological fluids such as serum and urine. The improved method utilizes the quantitative formation of insoluble barium sulfate in polyethylene glycol. The turbidity measured between 540 and 610nm is proportional to sulfate level in the sample. 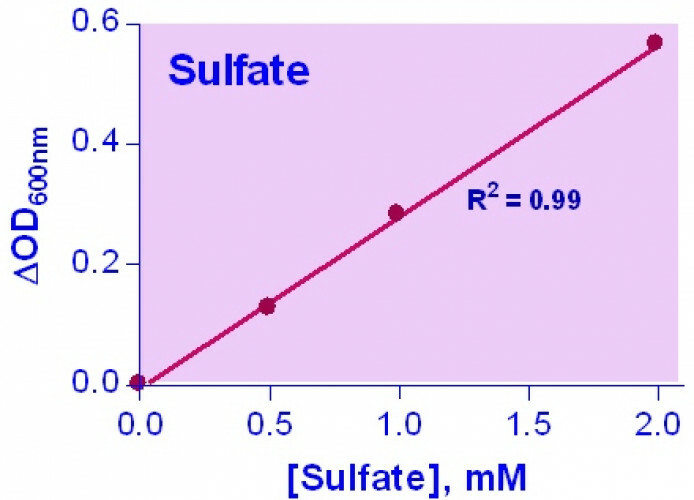 Applications For quantitative determination of sulfate ion and evaluation of drug effects on sulfate metabolism. References Assay: Sulfate in Fish Sulfate content of polysaccharides from ray skin (Raja radula) (Pubmed). 2. Ben Mansour, M et al (2009). Characterization of a novel dermatan sulfate with high antithrombin activity from ray skin (Raja radula). Thromb Res 123(6):887-94. Assay: Sulfate in Fish Ray skin tissue (Raja radula) (Pubmed). 3. Majdoub, H et al (2009). Anticoagulant activity of a sulfated polysaccharide from the green alga Arthrospira platensis. Biochim Biophys Acta 1790(10):1377-81. Assay: Sulfate in Bacteria culture medium (Pubmed). 4. Wang, ZM et al (2011). Structural characterisation and immunomodulatory property of an acidic polysaccharide from mycelial culture of Cordyceps sinensis fungus Cs-HK1. Food Chemistry 125(2):637-43. Assay: Sulfate in Fungi Sulfate content of exopolysaccharides from ascomycete fungus Cordyceps sinensis (Pubmed). 5. Ben Mansour, M et al (2010). Highly sulfated dermatan sulfate from the skin of the ray Raja montagui: anticoagulant activity and mechanism of action. Comp Biochem Physiol B Biochem Mol Biol 156(3):206-15. Assay: Sulfate in Fish Ray tissue (Raja radula) (Pubmed). 1. Ben Mansour, M et al (2009). Polysaccharides from the skin of the ray Raja radula. Partial characterization and anticoagulant activity. Thromb Res 123(4):671-8. Assay: Sulfate in Fish Sulfate content of polysaccharides from ray skin (Raja radula) (Pubmed).